The proposed book cover. I've always loved the classic LBB design. I'm hoping since this is a fan-made freebie that Marc Miller will see beyond any copyright infringement. Artificial sunlight shines down on a ship's botanist as he performs chemical analyses on a variety of otherworldly food crops while agrobots perform the more menial gardening tasks. I'm getting a bit closer to wrapping up the geomorph book. 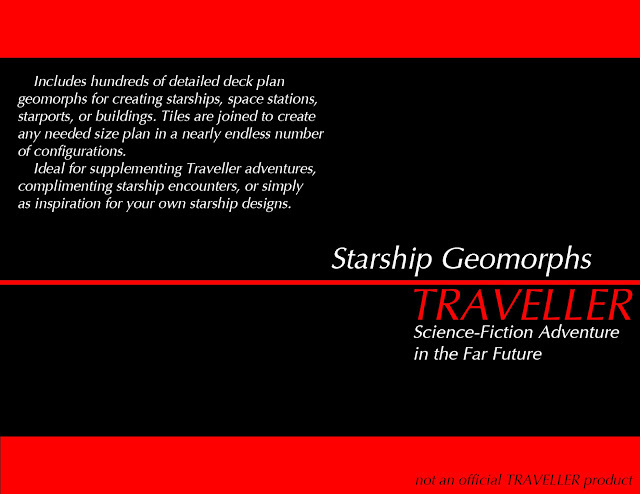 It has been sent to the editor while I get the remaining illustrations completed and tweak the final geomorphs. The book should be available between late August and mid-September and will be a free PDF download from this blog. While not part of a typical Traveller starship, the Agricultural Bay is a mainstay in science fiction for colony ships, inhospitable planets, and remote outposts obligated to be self-sufficient. By itself, gardening doesn't necessarily scream "action and adventure", so referees should consider all the myriad ways plants have been used in classic science fiction and modify as they see fit. The seed pods from "Invasion of the Body Snatchers", the alien spores from Star Trek's "This Side of Paradise", and Triffids are all fine places to start. Live crops and seeds can be valuable trading goods on some worlds, and are often a favorite target for customs officials. Ignoring transport protocols is sure way to introduce and invasive species into a new environment. Knowledge of alien botany could be a useful skill for a Traveller. Which ones are edible? Which are poisonous? Which are used to make medicine? Use your imagination and have fun! A very "Traveller" vibe going on in the Agricultural Bay. Can't wait to take a look! Have been enjoying your designs -- thanks so much for sharing your work! I can see a garden space being useful on long duration missions. Not only is it an additional source of food, but the manual labor can be something to do and break the monotony. Also, it could be a nice place for the crew to exercise as well.